A new poll from the Pew Research Center for the People & the Press finds that public dissatisfaction with Congress has reached record levels, with 67 percent saying they want to throw most of the bums out (up from 49 percent in 2006) and 33 percent saying they want to throw their own bum out (up from 28 percent in 2006). 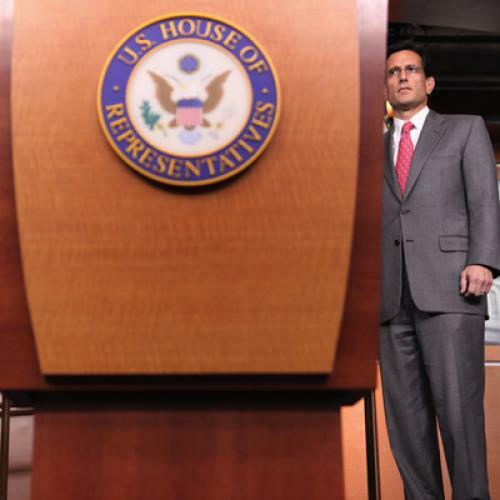 Fifty percent say the current Congress has achieved less than other recent Congresses. But the really interesting finding is that the public does not accept the "objective" message spoon-fed by the press that both sides are equally at fault. Instead, it (accurately) assigns most of the blame to the Republican party. Forty percent say Republican leaders are more to blame, as against a mere 23 percent who say Democratic leaders are more to blame. A larger proportion blames the GOP than blame both parties (32 percent). And among independents, 38 percent say Republicans are more to blame, against 15 percent who say Democrats are. So much for the hack story line that partisanship and political games-playing is paralyzing Washington. Partisanship and political games-playing by Republicans is paralyzing Washington. Which side is more willing to work with the other? Fifty-one percent say it's the Democrats, against 25 percent who say Republicans. Which side can better manage the government? Forty-one percent say the Democrats against 35 percent who say the Republicans. Which side is more honest and ethical? Forty-five percent say the Democrats, against 28 percent who say the Republicans. Even Republicans are apparently fed up with Republicans in Congress. A higher proportion of Republicans (70 percent) than Democrats (60 percent) want to throw most of the bums out, even though Republicans have the House majority right now. A slightly higher proportion of Republicans (28 percent) than Democrats (25 percent) want to throw their own bum out. Only 49 percent of Republicans approve of the job the Republican congressional leadership is doing, against 60 percent of Democrats who approve of the job the Democratic congressional leadership is doing. I hope the "objective" press reports these findings accurately, and doesn't bend itself into a pretzel trying to portray them as representing mere generalized disgust with partisan bickering in Washington.